Property Matrix is the world’s most customizable and user-friendly property management solution. For years, property managers like you have been forced to choose between a powerful system that can do everything they need, or a user friendly system that their staff can actually use. Those days are over. With Property Matrix, you don’t have to choose. You get it all. Work with a property management software that adjusts to your business, rather than one that forces you to adjust. Whether you manage 200 units or 20,000, Property Matrix is designed to handle the toughest accounting complexities. You don’t need to worry about calculating processing costs or transaction fees. There aren’t any costs to you. Ever. Do away with scattered documents throughout your office or a complicated folder structure on your network drive. Send email blasts and maintain all your correspondence with Tenants, Vendors and Owners in one place. We’re the only property management software that offers a fully editable report designer so you can create any report you can think of based on any information in the system. No more workarounds. With Property Matrix, you can separate companies and properties so that each company can own as many properties as they do in real life. Now you can properly manage a separate set of books for each corporation with ease. You can even manage sets of books for multiple property management companies. Our new interface utilizes the latest technology to deliver the clean, sleek, streamlined experience users have come to expect from a Web 2.0 product. We know your business is always on the go, so we optimized the entire interface to be fully functional from any mobile device. No basic apps, everything you can do on the desktop, you’ll be able to do on your phone or tablet. Use the integrated report builder to create all the reports you need. Save time and boost productivity by setting actions to happen automatically. No more bank runs. Scan and deposit hundreds of checks in under a minute. Work with one system that handles it all. Built in. Create your own fields to track important dates, events and notes. You can use custom fields to track anything you want. ACH, Credit Card payments and Maintenance requests are all online. Direct posts to Trulia, Zillow, Live Lovely and more. Quickly and easily send emails using powerful filter based recipient selection and email templates. Automatically pull TransUnion credit reports for new rental applications. Access Invoices, Bills, Reports and a full set of books for your management company. Easily pass on expenses to your tenants. Give your owners instant access to reports and important documents. Our company is new to Property Matrix but so far, we are loving this system! As the bookkeeper for our three properties, I searched high and low for a software that could meet all our needs at a reasonable price. We are so excited to be using this software because it’s a one stop shop. We couldn’t be happier with Daniel’s support and service from the start. I’m confident this is the one for your company as well, save yourself (and your staff) time and headaches. Try it, you have nothing to lose! 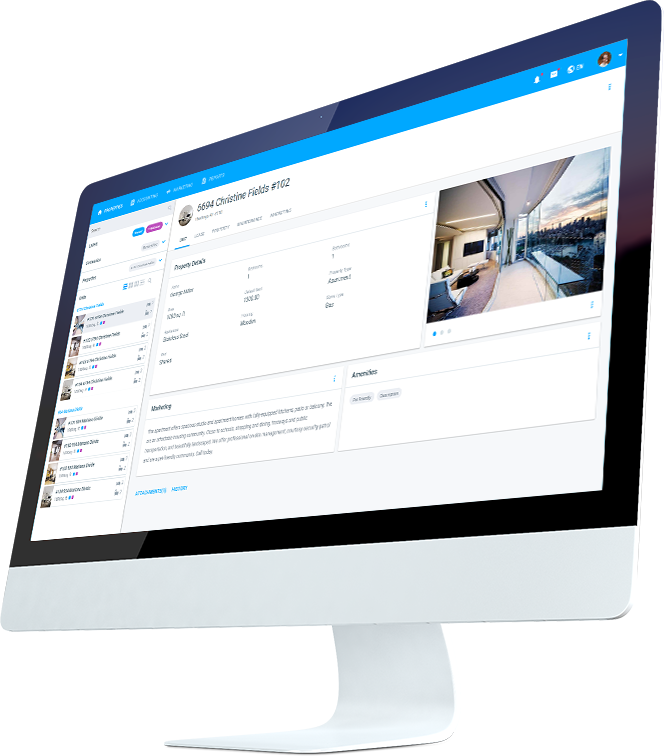 Property Matrix is built from the ground up to be an enterprise class property management software coupled with the user experience you’ve come to expect from a Web 2.0 product. We set out to build the most intuitive yet powerful platform for property management companies. Most importantly, you’ll find the most advanced customization options combined with unlimited phone support make it easier for you to­ tailor your software to your business, not the other way around. Schedule a demo with one of our reps and see why you just found the property management software you didn’t think existed. It will change the way you manage — for good.